I am an oncology nurse. Saying goodbye and grief comes with the job. However, no matter how accustomed I am to this, it is never easy. And no matter how experienced I get with this there are patients who will always leave such a mark on my life that saying goodbye to them will be like losing a part of myself. Today, I said goodbye to one of those patients. I first met this patient last summer. She was coming to us with her second primary cancer. She is a young mom. She was well versed in the cancer and chemo world already. She is gracious, compassionate, has a beautiful smile, is one of the fiercest fighters I have ever met, and has taught me so much in the last months I have gotten to spend with her. Even if I could share all the details of this patient, I could not clearly put into words what an amazing woman she is. This patient is one of the ones who hasn’t handled chemo well at all, in fact, she is absolutely miserable with chemo. We had every medication on board possible and every alternative treatment we could come up with, but no matter what the nausea came like clockwork. Despite the nausea though, we together as a team would battle through the chemo with one goal in sight… to give her just a little more time with her children. And just a few months ago when she had a clear scan, we danced and hugged and celebrated together. Last week I saw her for what I now know will be the last time. In my head I knew it would probably be the last time I would see her.. there is a 6th sense you develop after walking with so many people in their last days.. but there is always that twinge of hope… that maybe just maybe things will turn around. But they haven’t and chances are they won’t. Today her mom called into the clinic stating they wanted to give an update. A few minute later before I could realize what was going on there were 3 of us on speaker phone with her as we said our goodbyes. Her body is shutting down and the cancer is winning. And this woman that has taught me so much in the last few months will soon leave this earthly home for her eternal home. I am so beyond thankful for the absolute amazing opportunity to walk with her through her cancer battle. I am so incredibly thankful for the things she has taught me about life. I said it to her and I mean it, I will remember her for the rest of my life. And some of her final words to me will stick with me forever… “Erica every time you gave me a hug at the end of each chemo it was like our victory dance… we did it… we made it through another one…” And as she said those words… I realized just how much a simple hug can mean to someone. It is for this reason and these moments that I will grieve. I will walk through these awful emotions that go with letting go of someone who has been a part of your life. It is for this that I will allow myself room to heal. It is for moments like this that I will continue to be the best nurse I can… even on the worst of days… even on days where I feel burnt out. I will put my every effort into giving them my all even when, especially when I feel like I have nothing left to give. I will march through every little victory I can with my patients. Because I am their chemo nurse and I want them to know they don’t have to walk this battle alone. I’m a cancer nurse… which means I can sense sepsis coming from miles away and can smell an infection long before the signs and symptoms occur. I can’t remember all my patients who have gone septic, but I can remember my first one and always will. I was in my final weeks of nursing school and enjoying my last few times of just being a quick train ride away from NYC. I was about 5 minutes away from walking out my door to the train station just a few blocks away to ride into NYC for a party when I got the phone call. My best friend from high school had been battling a UTI. She had started an antibiotic but things were not proving… and when she called she sounded like death. I changed clothes, hopped in my car and drove what felt like an eternity (really only 15 minutes) to get to her apartment. I ran up the stairs flew through the door and ripped the covers off when I saw her pulsating stomach and felt her extremely high heart rate. I called a friend because I wasn’t even sure I could get Adel down the stairs. It took a while but I got her to the car and our friend Rachel met us at the entrance to the emergency department. I quickly parked the car and ran back in. When I saw her vitals it was in that moment that I wished I didn’t know what all the numbers meant. She was quickly rushed back and an IV thrown in her as the fluids started going. 3 liters in and her blood pressure was still well below the low range of normal and her heart rate was super elevated. She wasn’t able to pee and we sat waiting. Friends were cycling in and out and I was keeping her family posted on what was going on as her mom was on her way from a few hours away. It was in this situation I learned the value of hiding my emotions. I didn’t want Adel to know just how critical her situation was. After 3 liters of fluid and no new signs of improvement the doctors started to talk ICU. It was at this moment that Adel realized the severity of the situation. Thankfully, just a few minutes later she was able to pee and her vital signs started to stabilize a bit. She was admitted and stayed in the hospital for a few days receiving antibiotics and IV fluids. She was my first septic patient, but I’ve seen many since then. I write this blog to educate others on the fact that even healthy, vibrant people are susceptible to severe infections. Don’t take any infection or signs of infection too lightly and if something isn’t getting better when you are on an antibiotic let your physician know because the bacteria may very well be resistant to the antibiotic your on. Your life is important :-). Thankfully, in just a few weeks I get to stand by Adel’s side as she marries the man of her dreams and I’m so beyond thankful that she does have this opportunity :-). I’ve had this thought running through my head for a few weeks about how it is viewed that my patients need me. They need me to draw their blood, take their vitals, listen to their symptoms and help manage them, help make things clear and explain things, teach them about different things, give them their medications, listen to their struggles, and so much more. Even on the toughest days… the days where I struggle to smile or struggle to focus I know without a doubt I was made to be a nurse; specifically a nurse to cancer patients. It is on these days of struggle that I especially need cancer patients. I feel strange saying that I need cancer patients, but it is true. I want to make it clear… I have a strong dislike, really a hate, for cancer and wish that it didn’t exist, but I have first hand witnessed how something so ugly can produce some of the most beautiful stories. These patients and their families make my life so much richer. Through their battles I learn so much. Through their love for each other I learn so much. Through their ability to show their struggles I learn so much. My absolute favorite aspect of my job is sitting down and talking with these patients and their loved ones. It is knowing that at the end of the day I just don’t put medications in them and draw their blood, but that I truly have spent time with them. That when things get tough, they trust me. I think back on some of my favorite patient stories, and to be honest they are often hard stories, but beauty within them. The young dad who was going home on hospice, but still chose to enjoy every moment he could with his wife and son despite the excruciating pain he was in. The middle aged woman who thought I was crazy because I wouldn’t leave her side when she had elevated blood pressure, but smiled at me. I had the privilege of taking care of her almost every shift and her smile sticks in my head and heart. She had a grace about her that few have. One day I came in and I remember the shock I had as I heard she was actively dying. I had the privilege of knowing this incredible woman, and I had the privilege of taking care of her in her last few hours. Her grace shined through in her final breaths. I remember the man who had ulcerative colitis and on top of that a new diagnosis of cancer. He had a longer medical history than almost anyone I’ve ever seen. I took care of him for 3 nights in a row. On night one he could barely sit up on his own. By night 3 he was getting out of bed and walking. I have rarely seen such courage, hard work, and determination. It was through this patient I learned what determination truly looks like. I could talk for hours about the love I have witnessed in so many husbands eyes as they look at their wives. Often these women have lost all their hair, many have had mastectomies, and their color is gone. Their physical beauty is altered by all of this and normally many scars. But this is where I’ve witnessed what true love looks like. Because in these husbands eyes all I saw was love; pure adoration for their wives. It has been in these stories I’ve been challenged not to settle. To find a love that is as true as these that I’ve seen. Just last week while my patient is facing cancer, which makes so many of my battles seem insignificant, a very special patient wrote ME a note of encouragement. I had had a very bad week (you can read about it here) and this patient was encouraging ME. It is true when I say, I need cancer patients. They make my life so much richer. And I am so blessed and thankful to call myself a nurse of cancer patients. So as world cancer day is here (or possibly it is after it as you are now reading this), I want to challenge you. Challenge you to learn the stories of the wonderful people who face cancer daily. Challenge you to see how you can help raise money to fight this horrible disease. Challenge you to join in supporting these wonderful people during or after their battle. Challenge you to walk alongside the loved ones of those who have faced this disease not directly, but through walking this battle with a loved one. I promise you won’t regret learning their stories. Trust me when I say, you will not regret getting to know these incredible stories and these incredible people. How are you going to fight? I can still remember the day I got my acceptance letter almost 4 years ago like it was yesterday. It was a crisp fall day when that letter arrived in my mailbox. While in many ways it feels like just yesterday, in reality it was almost 4 years ago. Since then I’ve finished my masters, gone through an accelerated nursing program, and now have 2 years of nursing under my belt. Every day I am still learning a ton, but there a few things my now “experienced” nursing friends and I wish we had known when we first put on those scrubs and proudly put on that badge saying boldly and loudly “RN“. 1. If you feel like you are going to puke before every shift or drive to work in tears… don’t worry you aren’t alone. Same thing if this is what happens after your shifts. You are most definitely NOT alone. 2. Don’t accept just any job. While it is hard as a new grad to find experience, you will be spending A LOT of time there it is ok to wait for the right fit. 3. On that same note though, your dream job may take time, but a good fit is a GREAT place to learn. 4. Confidence in yourself. It takes TIME. And that is ok.
5. Sometimes SBAR isn’t all you need to tell the MD, PA, or NP. 6. Those silly code runs that are fake and make you feel ridiculous. They actually are REALLY helpful! 7. The field of nursing is wide and broad. Don’t limit yourself to just bedside nursing if it isn’t your passion, that is ok.
8. You DON’T HAVE TO KNOW EVERYTHING. It is ok to say “I don’t know” and learn for next time. 9. Asking questions doesn’t make you a bad nurse or make you stupid, it makes you SMART. That is the absolute best way to learn. 10. Every place has its own “Policies and Procedures”. Realize that how you learned something in nursing school may change during your first job… and your second… and your third… and so on. 11. You aren’t going to like every patient you take care of and that is OK. You just have to give every patient the best quality care you can. 12. Driving home from work… crawling into bed after a long night shift you’re going to realize “OH MY GOODNESS I DIDN’T CHART THAT 300 mL OF URINE!”. You aren’t perfect. If it is something that needs attention you can call in to the nurse who followed you, but if it is something that can be let go… let it go. Learn from your mistakes of not charting in the moment and figure out a system of remembering that works for you. 13. You have to come up with your own system of writing things down, charting, doing assessments, and managing your shift. It is perfectly ok if it isn’t like anyone else’s as long as it works for you and you can get everything done. 14. The first few shifts on your own you’re going to feel like a truck hit you and you’re never going to make it. But you will. 15. Don’t be afraid to go in the bathroom, sit on the toilet, and take some deep breaths. In the end every nurse has taken extra time in the bathroom just to catch their breath for a minute. 16. When possible…. waste the medications that needed wasted right then and there. That is just something you don’t want to even chance forgetting. 17. You are your patients’s ADVOCATE. Don’t be afraid to stand up for them. And if you’re wrong… oh well… at least you can leave knowing you fought for your patient. 18. Keep your social life. 19. Try as best as possible to lead a healthy lifestyle outside of work. 13 hour shifts are brutal. 20. If you’re in MedSurg… we feel your pain. But know this. YOU ARE GOING TO LEARN A TON! 21. There is a person beneath that rude and frustrating patient. Do the best you can to find that person and care for their soul too. 22. Find hobbies outside of work that help you unwind. 23. This is a 24 HOUR institution if you are in a hospital. Leave the patients with the other nurses. They are trustworthy and capable :-). 24. Don’t be afraid to stand up for yourself. You went to school for this. You’ve done your training. You’ve come this far. You don’t need to be walked all over. 25. As you learn your area of specialty things will really start to fall into place. You’ll understand things better and you’ll be able to tell earlier and earlier when something is wrong in a patient. Never underestimate the little things. They can in the end be warning signs for something much much bigger. 26. You are only one person. Do not be afraid to ask for help! And one of the best things you can learn how to do is delegate appropriately… but don’t forget to double check that things that have been delegated are done. 27. When you’re tired, warn out, smelly, dehydrated, not sure what is on your shoes, and squinting at the sun light as if you were a vampire know this. YOU ARE GOING TO MAKE IT! You are an incredibly intelligent person who has fought hard to get this far in your dream. Keep running after it with your whole heart! And don’t be afraid to try a few different areas until you find your passion (but make sure you give each area an ample amount of time before moving on). P.S. It is true the more you know… the more you realize you don’t know anything :-). I recently ran into a girl who I cheered with in high school. There is a bond between athletes from any sport that never seems to fade. It is a pretty incredible thing of what working together as a team can do to bond people together. As we were catching up, there was another bond that was found. She is a brand new nurse. She is exactly where I was 2 years ago. No matter what area of nursing or what path you have taken, the letters RN will bring you into an incredible community of people who you will forever have a bond with. Since 2 years ago I’ve come a long way. Recently there was a blog that went viral Not Just a Nurse. I encouraged this new grad RN to read this. I can’t tell you how many times “I’m just a nurse” has come out of my mouth. There is such a vulnerable truth that is spoken in this nurse’s blog. A truth that needs to be heard. But it also brings up another truth about being a nurse, it is incredibly hard to be healthy in most nursing jobs. I started my career 2 years ago as a nurse at the bedside. I had spent the last 7 years in school. And the summer before working at a teen weight loss camp. Here I was in my first full time big girl job. Little studying to do, but a ton to learn on the job. I had a brand new schedule that for the first time in my life had no sort of consistency. And I came home from work at least 13 hours after I had left for it. While at work I was constantly stressed and terrified of making a mistake. Being a new grad nurse was probably one of the absolute HARDEST things I have ever done in my life. All day long my brain was going and my body was moving. You are constantly worried about what you could do to lose your license or worse, lose a life. You have to learn how to best communicate with different types of MDs, PAs, and NPs. You have to learn how to delegate to the nursing assistants and how to keep track of their work along with yours. Your brain doesn’t stop going. On the outside of work it is hard to get patients off your mind. You wonder if you wasted all the medications you needed to. You wonder how you can manage time better. How are you ever going to be fast enough to get all your things done AND all your charting done? Nursing takes a HUGE emotional and physical toll on your body. You’re going to struggle to figure out how to stay healthy during your shifts and days off. Here are a few tips. 1. Remember to stay hydrated. You have a very physically active job. Your body needs water not just caffeinated beverages. 2. If writing helps, journal. You have a lot going on in your heart and head after each shift. 3. Make your meals ahead of time. Before a long stretch of shifts make your food so you aren’t tempted to eat just fried food. 4. Keep a healthy snack in your pocket. 5. Remember you CAN’T do it all. 6. Listen to your body and how much sleep it needs. 10. Develop a support system both inside and outside of work. Do not be afraid after a long shift to call that nursing friend and vent for as long as you need. You are entering into one of the most amazing careers. You will struggle. You will doubt. You will look at your fellow nurses and ask “why did we choose this?” My dear friend, you are going to see things you never thought possible. You are going to do things that most people would never be able to handle. You were created to do a very unique and incredible job. It is perfectly ok to feel overwhelmed. But there will be moments when the patient breaks down in tears and you are there holding their hand. When the family member hugs you after their loved one has passed and says “I’m so glad you were their nurse”. When the new baby is born and you get to help see that beautiful life come into the world. When the patient goes into remission and you are the one rejoicing with that patient as if you were in remission. When the patient hears they are getting the organ they’ve been waiting for. You are there to walk through the valleys and mountains with these patients and their families. When it gets tough, remember the reasons why you chose nursing. That RN is an incredible gift that means more than you could ever imagine. 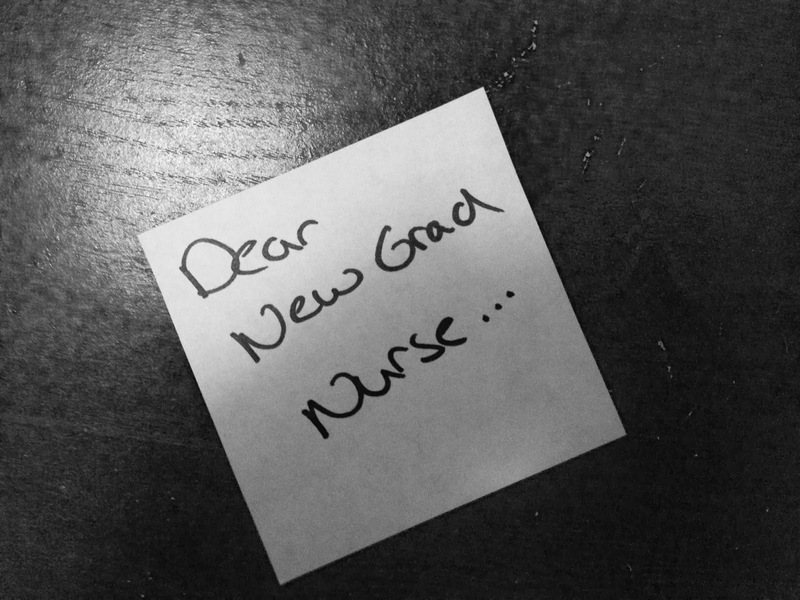 My dear new grad nurse, its your time to shine! Take it one step at a time. You. can. do. this!